Water play is a fun experience for most children, but the feeling of standing in a pool with water up to their waists can create a sense of panic in some toddlers. This fear in their mind can lead to aquaphobia. If you want your child to overcome this unnecessary fright, swimming accessories may be an ideal choice. On one hand, these accessories provide an extra layer of protection while at the same time helping in developing confidence to swim without the fear of drowning. Trainers don’t recommend that children develop dependence on such devices once they are confident in the water, however. Sometimes water can get into the ear canal while swimming. For those prone to ear infections or “swimmer’s ear” this can be problematic. Some children find the sensation so bothersome they don’t even finish the session. Earplugs can be helpful in such cases and a fairly inexpensive. They are made of soft materials such as silicone, foam, rubber and wax. They come in several sizes so that you can choose those that fit best. Nose plugs are also available for children new to holding their breath under water, aiding in keeping water from being inhaled through the nose. They come in clip or pinch design. Pool water is most often chlorinated. Chlorine acts as a disinfectant against most harmful microorganisms. Some children are not bothered by the chlorine while others experience significant irritation to the eyes. It is better to protect your child’s eyes by encouraging them to wear goggles. 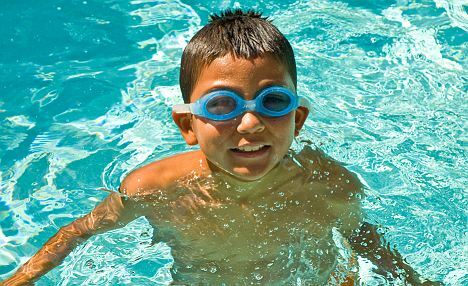 Goggles not only protect eyes from chlorine, but also improve underwater vision. They come with an anti-fog coating and lenses treated to control the condensation, which occurs during swimming. The rubber or silicon edging provides a watertight seal around the eyes, preventing water from seeping through the goggles. You can even opt for UV protection. Goggles come in wide variety of sizes and shapes. There are even swim masks, which cover a greater portion of the face while swimming. Floating takes time, which varies from child to child. This often depends on how comfortable your toddler is in the water. During the initial phase, floating devices can help toddlers become accustomed to the water. If you are wondering which floating device might be best of those you’ve seen used at AquaTots Katy, let us clear up any confusion. They may come in various forms but they all serve the same purpose. There are some floats that are designed to lift the face of an unconscious swimmer up, until rescued. You can buy these for your safety but when your child is in the pool, they are under the supervision of experienced trainers. All they’ll need there are basic noodles and kickboards. There are also belts made of long pieces of foam. These fit around the waist providing extra buoyancy in the water. It is advised not to depend too much on devices as it delays the floating ability in your child. These act as a support in developing self-confidence among children, who have just started swimming. Regular exposure to chlorine can damage your child’s hair. Swim caps come in handy for protecting hair and they keep the pool clean and maintain hygiene. They also keep hair our of your child’s face while swimming, which is irritating. 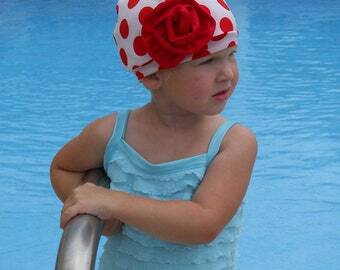 Encouraging your children to wear swim caps also allows them to have clear visibility. The caps are made of various materials: latex, silicone, and Lycra; select the one that suits your child. Apart from these, there are many other swimming accessories. Be certain to select gear that is free from defects for your child’s protection.